Our Dorchester branch carries a diverse range of paints to satisfy the needs of tradespeople and home owners wanting to transform their homes. As well as the usual decorating accessories, we have a large selection of wallpaper books to browse, and dedicated terminals where customers can view paints and wallpapers. You’re always welcome to bring the children with you, as we have a kids’ area to keep them happy while you shop. Our team is proud of the relationships they’ve forged over the 30 years we’ve been in the town. And if you hear local tradespeople refer to Wessex Decorators, that’s who we were before we joined the Brewers family. We’re easily found. 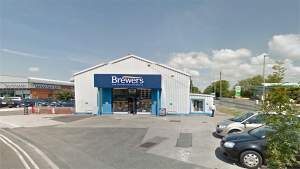 Our showroom is right next door to the Mercedes dealership and directly opposite the BP garage and Lidl on the B3147 as you head north out of Dorchester. There’s lots of customer parking directly outside, easy disabled access and you’ll find a welcome, homely feel inside. We can also arrange for local delivery if you can’t make it into store. Travelling south in to Dorchester on the B3147, with the Westleaze junction on your left, Millers Close is the first turning on the right. Heading north out of Dorchester on the B3147, Millers Close is the left turn before Westleaze which is on the right hand side.